The last game of the year: where is 2015? Well it's probably hiding somewhere in Mateusz Skutnik's new point and click game. A very very happy happy new year to all of you and see you in 2015 with lots of new games! Find seven apricots to get out in the latest escape the room game by Funkyland: fruit kitchens #15 apricot orange. It's a tradition here at bontegames to present you my personal top 10 browser games of the year. So from all the free browser games that were released this year here are the ones that I enjoyed playing the most. That's it for my personal favourites of 2014. What were yours? Feel free to add your own top in the comments below! 25 iOS - Android and Sweet Drmzzz iOS - Android. I hope you enjoyed this list and I'm wishing you a merry Christmas and a very very happy happy 2015 with lots of new games! A new escape the room challenge by Robamimi, have fun escaping from snow dance 2. The hunt for stars continues, Yoshio Ishii made another episode of his star hunting puzzler: minnano hoshi saga 3. The levels were contributed by fellow Japanase game designers and are Christmas themed this time. Hohoho, it's a tradition here at bontegames that I make a Christmas themed game every year and it's that time again! I'm presenting my free Christmas present for you: a brand new bontegame! 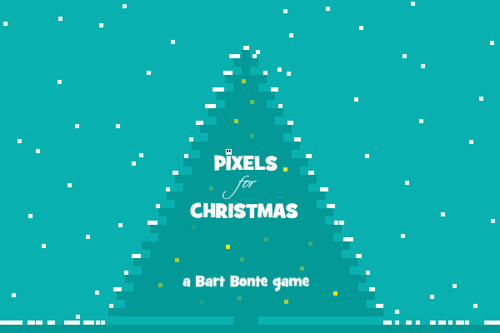 Enjoy Pixels for Christmas! It's almost Christmas, so get all the golden pixels using the cursor keys! This time the game is a html5 game (made using the excellent Phaser framework) so you will need a recent browser to play. Enjoy the game, spread the word, share the game and merry platforming! Cheers! The door is locked and the room is full of Christmassy puzzles to be solved before you can escape: ginger joy, the latest escape the room game by TomaTea. Solve all the puzzles, help Santa fix the workshop and get him on his way to make the monkey go happy again in this new point and click puzzler by Robin Vencel: monkey go happy north pole. Sirtet by Stray is a kind of reversed Tetris: draw the shapes by clicking or dragging on the tiles and try to remove whole lines (you can draw the shapes rotated too). Guide the girl home through a path of thorns using the cursor keys in the puzzler path of thorns by Cosy Cave for the 'entire game on one screen' themed Ludum Dare 31 game jam. Have you got what it takes to escape from the room in kyuukei escape by Kamotokamo? Press the switches and watch the level transform around you in the platformer slimey's quest by Letmethink for the 'entire game on one screen' themed Ludum Dare 31 game jam. Who will you fight when there is no one to fight and who will you love when there is no one to love? A new Daniel Merlin game: the empty kingdom. Reach the exit by pressing every switch in the puzzle script puzzler green line by Daniel Hooper (Z to undo a step, R to restart a level). Find seven muscat to get out: it's the latest escape the room game by Funkyland: fruit kitchens #14 muscat green. Drag the robots horizontally or vertically and place a robot over each switch to finish a level in the puzzler slydrs by Oliver Pearl. A system update takes a bizarre turn in the point and click adventure I was on the throne by DiscoFish and Skyflys. A new episode in Funkyland's escape the room series: find five gryphons to escape from alice house #08 mock turtle and gryphon. Solve all the puzzles, find the Thanksgiving turkey and share it to make the monkey go happy again in a new episode of the point and click puzzle series by Robin Vencel: monkey go happy thanksgiving. The continuation of the surreal point and click adventures created by DrawManEater: nekra psaria 2. Enter from one door and exit from another by drawing a path that crosses every square exactly once in the puzzler alcazar by The Incredible Company. The hunt for candies is on again: find the five candies to escape from candy rooms #18 by Funkyland. Neutral has over the years made a couple of mini escape games that were only available for a limited time as banner games. Today Neutral has put the remade English versions online, so good luck (re)playing all 3 chick mini games. 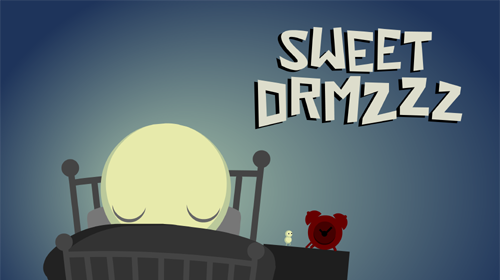 Time for an update on my latest mobile game 'Sweet Drmzzz' that was released last week. First of all thanks to everyone who already got the app and for supporting bontegames! So who has already completed the game? Exciting news: yesterday the game was reviewed on major mobile games site PocketGamer and it received their Silver Award! You can read that review here. Now this is the one time in a year that I ask money for a game, to support my future free browser games, and to support the bontegames site. So for only one dollar you can get this 'elegant, charming and challenging masterclass in simple and intuitive game design' (those are the words from PocketGamer, not mine ;) ) and support bontegames in the meantime! Here is where you can get the game for Android, for Apple iPhone/iPad or for Amazon Kindle. One more thing, if you have already got the game, can you please take a minute to leave a rating/comment in the app store, it really helps the discoverability of the game, thanks so much! Now, time to start thinking about and working on that next free game, my yearly Christmas game... Cheers! You get lost in a mysterious cave in which nothing has color anymore except for some strange moving artifacts and devices: kallaz, a puzzle platformer by Koozek. Find seven cherries and you're out in the latest escape the room game by Funkyland: fruit kitchens #13 cherry pink. Launch day is here! 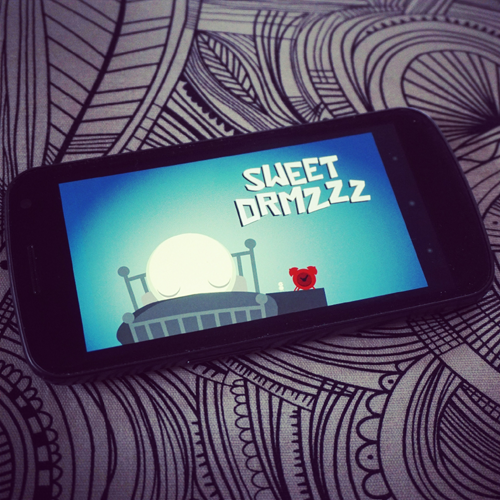 Today I'm proud to present my new mobile game: Sweet Drmzzz. You can get the app now for your iPhone, iPad or iPod Touch here in the Apple app store or for your Android phone or tablet here in the Google Play store. You can watch the trailer here. What once started as a small Nitrome jam game has now grown into a full-blown mobile game with lots of levels. When sleep sets in, the mini version of you gets in the alarm clock, is launched into space and sets off for many levels of spacy point and click, puzzle and arcade action. Solve logic puzzles in space involving coloured space worms popping out of planets, collect stars in snake-style arcade levels where the logic and difficulty changes as you make it through more levels and draw to direct space dust as it trickles out of your alarm clock because the space worms need it! I have worked very hard on this one, so please give it some love by playing and rating and commenting in the app store. Thanks and enjoy the game! Use the cursor keys to travel the mysterious world and find out how to overcome obstacles in the linguistic platformer onomastica 2 by mif2000. While sailing you lost your boat by a massive storm and end up at the lighthouse island, so now you must escape the lighthouse island in Selfdefiant's latest escape game. Drag square sum-tiles through a sequence of round num-tiles so all the sums at the end are equal to zero in the puzzler sum tracks by Elio Landa.